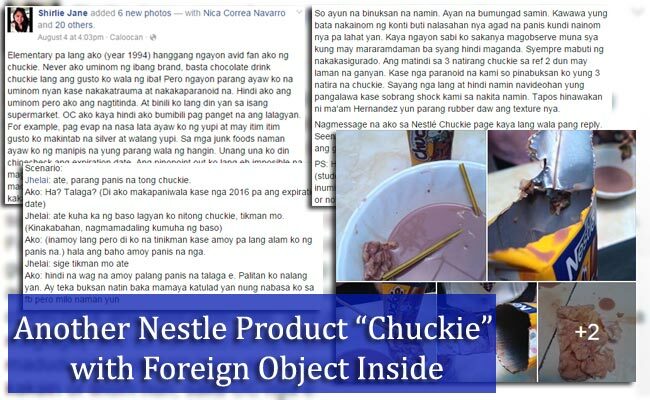 After the the viral photos of Milo had lately circulated on Facebook, another Facebook user posted photos of Nestle Chuckie chocolate drink with alleged foreign matter in its content. 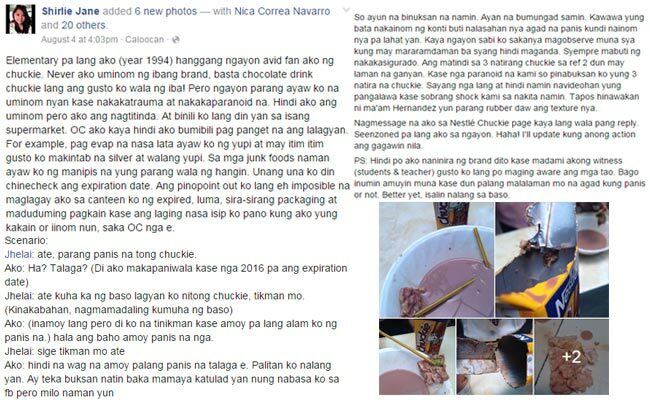 According to Facebook User Shirley Jane, she had been an avid consumer of Chuckie since she was in the elementary years, unfortunately, she was shocked due to the incident. She called herself OC as she is particular with the products she puts in her canteen ( probably a school canteen). Whenever she buys canned goods, she make sure it has no dents, she usually inspects the junk foods she buys and she never forgets to check the expiration dates. With this, she wants to make a point that she always makes sure of the best quality of the products she sells in her canteen. A customer named Jhelai bought a Chuckie in her store, but came back saying that it tasted spoiled. Shirley Jane was confused as she was sure that its expiration date is on 2016. She then got a glass and poured out the contents which surprised her and the other customers as it contained a foreign matter. She said that the foul smell had immediately came as soon as she opened the pack, making her decide not to taste it as suggested by the customer. Remembering that she still had three tetra packs in stock in her refrigerator, she decided to open them too. Two packs also had identical foreign natter and she was disappointed. Shirley Jane shared that she already contacted Nestle Chuckie through their Facebook page but to no avail. She clarified that she did not want to tarnish the name of the company, but she is concerned about the other customers. 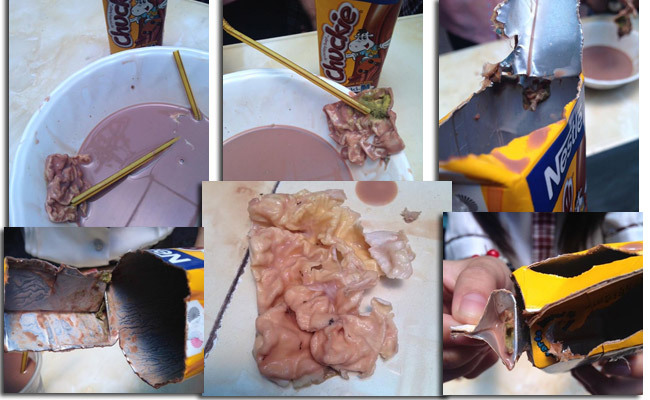 On the other hand, with the Milo incident, Nestle Philippines said in its statement that the solidified matter found by the mother in the Milo Tetra Pack is milk concentrate cause by exposure to air and heat.